Raspberry Macarons are the ultimate sandwich cookie with the perfect combination of textures and flavors. 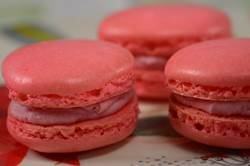 You have two pink colored meringue cookies sandwiched together with a raspberry filling. Bite into one and see how the outside of the cookie is wonderfully crisp yet the inside is so soft and chewy. And the meringue cookies have a sweet almond flavor that pairs so nicely with the tart and tangy raspberry filling made with cream cheese, mascarpone cheese and homemade raspberry jam. The technique for making Macarons can be tricky as there are so many factors at play here - the quality and amounts of ingredients, the mixing of the batter, the pans, the length of resting time, the oven temperature, and the baking time. First, use top quality ingredients, and to get accurate amounts of each ingredient, my preference is to measure by weight (grams) not volume (cups). I like to use a digital scale for measuring. Next, if possible, the egg whites should be 'aged'. Which means separate the eggs at least a day before making the Macarons. Cover the egg whites with a piece of paper towel (to let the whites breath) and place in the refrigerator. Then, several hours before making the Macarons, remove the whites from the refrigerator and bring to room temperature. (This ensures that the whites will reach their full volume when whipped.) Next, the ground almonds. You can either buy almond meal/flour or you can take whole blanched almonds and process them in your food processor until finely ground. The next step is to process the ground almonds, along with the confectioners sugar (powdered or icing), for a minute or two until finely ground. Once that is done, sift the mixture to get rid of any large pieces of almonds. Now, there are two parts to the batter, making the meringue and then folding the almond/sugar mixture into the meringue (called macaronage). As always, when making a meringue have your mixing bowl and wire whisk clean and free of grease. Once you have made the batter and piped the cookies onto your baking sheets, it is important to let the cookies rest before they are baked. Normally they need to sit between 30-60 minutes (depending on the humidity and temperature of your kitchen) or until they are no longer tacky when lightly touched. Raspberry Macarons: Have ready three baking sheets lined with parchment paper. To make all the Macarons the same size, I like to make a template. Take a piece of parchment paper and draw 20 - 1 1/2 inch (4 cm) circles, spacing the circles about 2 inches (5 cm) apart. Place the template under your parchment paper so you can use it as a guide when forming the cookies. Place the ground almonds and confectioners sugar in your food processor and process until finely ground (about 1 to 2 minutes). Sift the mixture to remove any lumps. In the bowl of your electric mixer, fitted with the whisk attachment (can use a hand mixer), beat the egg whites and cream of tartar, on medium low speed, until soft peaks form. Gradually add the superfine sugar, and continue to beat, on high speed, until the meringue just holds glossy and stiff peaks (when you slowly raise the whisk the meringue is straight up, no drooping, called a 'beak'). Whisk in a few drops of the pink gel paste food coloring. Then, in three additions, sift the ground almond/sugar mixture over the meringue. Fold the almond/sugar mixture, using a large spatula, into the meringue by cutting through the meringue and then fold up and over, making sure to scrape the bottom and sides of the bowl. Once the almond mixture is completely folded (called macaronage) into the meringue (the batter will fall back into the bowl in a thick ribbon) it is time to pipe the Macarons. Fill a pastry bag, fitted with 1/2 inch (1 cm) plain tip, with the batter. Pipe rounds of batter onto the parchment paper, using the template as a guide. Then, gently remove the template and gently tap the baking sheet on the counter to break any air bubbles (can also break air bubbles with the end of a toothpick). Let the Macarons sit at room temperature for about 30-60 minutes (depending on the temperature and humidity of your kitchen) or until the tops of the Macarons are no longer tacky. Meanwhile preheat your oven to 300 degree F (150 degree C) with the oven racks in the top and bottom third of the oven. Bake the cookies (two sheets at a time) for about 16-20 minutes, rotating the pans top to bottom, front to back, about halfway through baking. The Macarons are done when you can just barely separate the cookies from the parchment paper. (If you find that the bottoms of the cookies brown too much, double sheet your baking pans.) Remove from oven and place the baking sheet on a wire rack. Let the Macarons cool for a few minutes on the baking sheet. Then, run the blade of an offset spatula or knife, under the macarons to separate them from the parchment paper. Place the Macarons on a wire rack to cool completely. Raspberry Filling: In a bowl beat, or whisk, the cream cheese with the mascarpone cheese until nice and smooth with no lumps. Stir in 3-4 tablespoons of raspberry jam (or to taste) until well combined. Place in a small piping bag (or small freezer bag), fitted with a small plain tip. To Assemble Macarons: Start with two cookies of about the same size. Pipe a round of raspberry filling onto the flat bottom side of one cookie. Take the second cookie and place it (top side up) on top of the filling to sandwich the two cookies together. The Macarons can be stored in the refrigerator for two to three days, or they can be frozen for about a month. Best served at room temperature. Makes about 25-30 Raspberry Macarons. ** Separate eggs at least 24 hours before using. Cover the egg whites with a piece of paper towel (or cheesecloth) and place in the refrigerator. Bring to room temperature before using. *** Make superfine sugar by processing regular granulated white sugar in your food processor for about 30 seconds or until sugar is finely ground.